Welcome to Duffy's Dog Training Center... the premier canine training facility serving the Louisville, Kentucky and southern Indiana area. We have over 26 years of dog obedience and canine training experience, and are equipped to handle all aspects of your dog behavior and people training needs. Our approach to dog behavior handling is always positive: We minimize deterrents and capitalize on incentives. Client dog handlers at our training center learn to be firm without being physically harsh, motivational without losing control, and focused & consistent so they can be successful! Our dog trainers have become Family Dog Specialists through the many years of successfully obedience-training hundreds of dogs and their families. 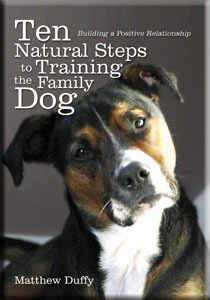 This holistic approach to dog training is key to helping turn your family pet into a family member. So if you need help with housebreaking your dog or dogs, have problem canine behavior issues, or require specialty training such as handicap assistance or competition conformation... please call us anytime for advice and a free evaluation.